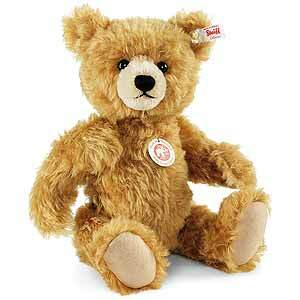 Paddy Teddy Bear by Steiff. This beautiful limited edition piece in golden brown mohair, is fully jointed, carries the white ear tag, which signifies it as a Steiff limited edition and wears the famous gold plated button in ear, Limited edition of only 1500 pieces worldwide. Product details: safety eyes, synthetic filling material, growler, total size 32cm. Comes boxed, together with a numbered certificate of authenticity. Ready to conquer his world: With Paddy, a completely new type of bear is on the way. Bear lovers spontaneously look at his nose. No wonder - it is a splendid specimen: being large, wonderfully oval and in rosé beige as a contrasting colour to the fine, golden brown mohair, it spontaneously enchants the beholder. At the same time, Paddy´s snout is actually very small. That can mean only one thing: Paddy loves the scent of spring blossoms and what he likes best is to sit in the middle of the flower meadow and sniff for tasty delicacies in the softly tempered wind.